Daniel Ricciardo hits back at F1 critics following a difficult start to his new tenure with the Renault squad. Renault Formula 1 driver Daniel Ricciardo says he has not suddenly forgotten how to drive and has called for patience when it comes to judging his early 2019 performances. Following his switch from Red Bull to Renault ahead of this season, Ricciardo has struggled to match the pace of teammate Nico Hulkenberg and endured a frustrating start to the new campaign. The Australian is yet to score a point for his new team after a disastrous home debut in Melbourne was followed by a late mechanically-induced retirement at the second round in Bahrain. “It’s only the third race. I think some people are thinking we’ve had half a season already,” Ricciardo said when asked if being judged on his lack of early results at Renault is fair. “But I accept it,” he added. “It is short term but probably in all top sports - it is like in football, one guy gets a hattrick and then in the next two games doesn’t score a goal. And it is like: what’s happened? But maybe one or two weeks ago he was the king of the show. “When you are at the top level of any sport people always have an expectation that you should be at that top every single day. So I am not angry about that, I get it. The main thing is that I just know in myself what I need to do. “For sure people will sometimes get impatient. But as long as I know I am in the right direction then that is cool. Sometimes it might take a bit of patience. But it is all good. Ricciardo admitted he had been “overdriving” in an attempt to adapt to Renault’s R.S.19, and cited a lack of confidence under braking in Bahrain. However, he feels he has made strong progress in China as he beat Hulkenberg to seventh place on the Shanghai grid. “This weekend as a whole has been a bit smoother,” he explained. “Yesterday morning, already in first practice, I felt more comfortable. I’m not surprised [with seventh in qualifying] because as from yesterday it was already in that direction. “I felt like I could just get on top of the car a bit more. It is still not perfect, but as far as a feeling this weekend it has been good. Pretty happy. It is cool. 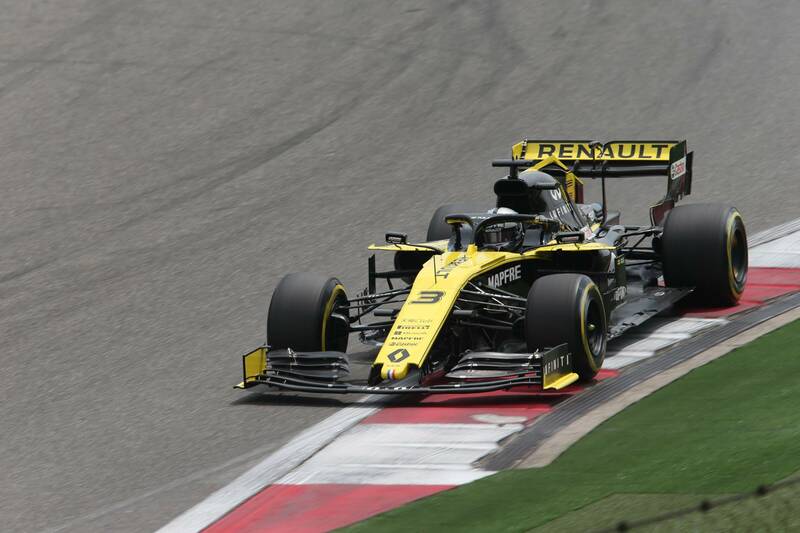 Ricciardo, who won last year’s Chinese GP from sixth on the grid, is remaining realistic about Renault’s race-day prospects as he targets getting off the mark for the French squad. “On paper we are at the front end of our group, [but] in terms of the three teams in front of us, [they] do have faster cars at the moment,” Ricciardo said.